“It was the age of Picasso, Chagall, Stravinsky, Diaghilev, and Matisse. Paris from 1910 – 1920 was a blank canvas waiting for the next generation of innovators to usher in a new age of inspiration. This is where Picasso continued his legacy and inspired other artists to do the same. Sergei Diaghilev brought Russian-influenced choreography to Parisian audiences. Famous dancer, Isadora Duncan, developed modern styles still in use today while novelist Marcel Proust was busy crafting his most famous works. Stravinsky briefly settled here, just long enough to create new arrangements and songs. Paris inspired a renewed energy and endless opportunities for artists to leave their mark on the world. These artists began twisting and breaking the rules of creativity, redefining what the world recognized as art. On Sunday, I attended one of the most exciting orchestra performances I have ever seen, based upon the music and choreography of Paris’s Ballets Russes and the fruitful collaboration between Sergei Diaghilev and Igor Stravinski. The performance included new choreography for Pulcinella performed by the Pennsylvania Ballet along with the Orchestra. 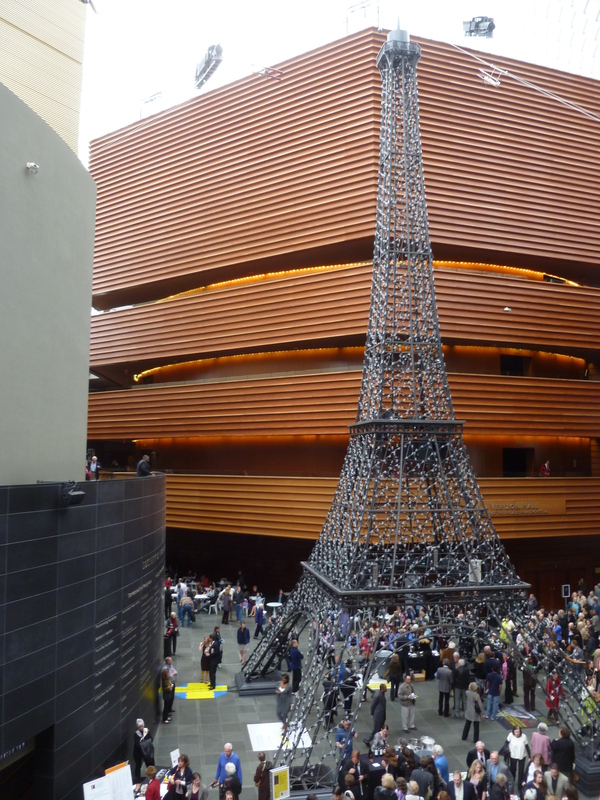 In addition to the Eiffel Tower, there were wine tastings, a crêpe cart, free live music post show, and a gourmet French meal in the café at the Kimmel Center. While it’s not Paris, it’s quite, quite lovely. Il faut le voir pour le croire (eel foe luh vwarh poor luh crawhr) means “it has to be seen to be believed” or “seeing is believing.” That’s how I feel about the PIFA events this month. Check them out for yourself if you can. This entry was posted in Ballet, Events, Music and tagged Eiffel Tower, il faut le voir pour le croire, Kimmel Center, Pennsylvania Ballet, Philadelphia International Festival of the Arts, Philadelphia Orchestra, PIFA. Bookmark the permalink.